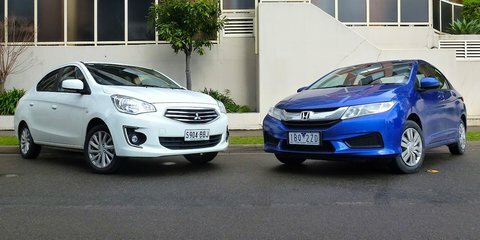 Australia’s largely unloved baby sedan segment has just had some life injected into it with the release of the new Mitsubishi Mirage sedan and second-generation Honda City. Slow sales have meant light sedan rivals have come and gone – Ford Fiesta, Kia Rio, Mazda 2 and the recently axed Nissan Almera – and those that remain are outsold many times over by their five-door siblings, including the Holden Barina, Hyundai Accent and (previous-generation) Toyota Yaris. The key selling point of light sedans is their surprisingly spacious interiors. The Mirage’s boot measures 450 litres, while the City’s is a whopping 536L – some 41L larger than that of a Holden Commodore sedan. Their rear-seat legroom (if not shoulder space or headroom) is also on par with traditional family sedans worth twice the price. The Mitsubishi Mirage sedan starts at $14,490 for the five-speed manual. Choose the automatic continuously variable transmission (CVT) for $2000, and it aligns with the starting price of the Honda City VTi manual. You can choose, as we did for this test, the high-grade Mirage LS with CVT for $17,490, which is only $500 less than the City VTi when optioned with the same type of automatic gearbox. So it’s flagship Mitsubishi versus entry-grade Honda for this fair fight of budget sedans. As you’d expect from a top model, the Mirage LS (below) boasts a number of features unique in this test including 15-inch alloy wheels (the City gets steel 15s), automatic headlights and wipers, keyless entry with push-button start, single-zone climate control (versus the City’s manual air conditioning), and a leather-wrapped steering wheel and gear-knob. Despite being a base grade, the City VTi (below) offers features not available in its rival, including standard cruise control, two USB ports (the Mirage gets one), a more detailed trip computer, and most significantly a reverse-view camera housed within Honda’s impressive Display Audio system that also basically gives you satellite navigation for free. The system uses ‘mirroring’ technology that allows smartphone users (only iPhone 5 and 5S at this stage) to use selected applications as they would on their phones on the car’s 7.0-inch colour touchscreen. One such app is HondaLink Navigation, which costs $49.99 to download and purchase a three-year subscription to its mapping and navigation data – just make sure your phone has plenty of data usage included. Mirroring does, however, require drivers to connect their phone to the car with USB and HDMI cables that are left to lie messily at the base of the centre console, betraying the otherwise clean infotainment design. Both sedans come with four-speaker audio systems and Bluetooth phone connectivity with audio streaming, though the City’s touchscreen system is far more intuitive to use than the Mirage’s that requires voice command prompts to setup, which are unclear unless you read the owner’s manual. Six airbags (dual front, side and side-curtains) and electronic stability control headline matching safety packages. The Mirage wins back a clear value lead with its superior aftersales support, however. It comes with Mitsubishi’s standard five-year or 130,000km warranty, easily eclipsing Honda’s basic three-year or 100,000km cover. Mitsubishi also uniquely provides one year of free roadside assistance. The Mirage is also considerably cheaper to service. Both manufacturers offer capped-price servicing programs, though the Honda requires attention every six months or 10,000km compared with the Mitsubishi’s yearly or 15,000km intervals. Three years or 60,000km will cost City owners $1787 – a significant $917 more than the Mirage over three years or $627 more to 60,000km. Little appears to split the duo in that other major ownership cost: fuel. According to official figures, the Mirage uses 4.9 litres per 100km on the combined cycle, bettering the City’s 5.7L/100km rating by more than 14 per cent, though in our real-world test, which included a mix of suburban, freeway and rural driving, it was the Honda that claimed a narrow victory (6.4L/100km vs 6.6L). The City’s drivetrain (below) is its highlight, offering refinement unmatched by many vehicles costing twice as much. The 1.5-litre four-cylinder petrol engine – carried over from the previous City – retains its peak power and torque outputs of 88kW at 6600rpm and 145Nm at 4600rpm. The Mirage’s smaller 1.2-litre three-cylinder engine produces significantly less power and torque, as you’d expect, topping out at 57kW at 6000rpm and 100Nm at 4000rpm. The Honda’s superiority is evident across the rev range. It’s quiet and settled at idle, where the Mitsubishi’s grumbles and sends vibrations through the steering wheel. The City’s extra 31kW and 45Nm makes for brisker acceleration with noticeably less strain, despite its 163kg weight disadvantage (1103kg vs 940kg). Neither is especially quiet as the revs rise beyond 3500rpm, though the City’s 1.5 remains refined on the approach to its redline, contrasting with the Mirage’s thrummy three-pot (below), which is boisterous, gruff and develops a high-pitched whine north of 5000rpm, detracting from passenger comfort. The Mirage’s CVT is the engine’s BFF. It gets the best out of the modest unit, acting instinctively on hills to increase engine revs without the driver needing to ask for more throttle. It is a surprisingly effortless freeway cruiser. The City’s CVT is slightly lazier and less intuitive, though it can afford to relax a little more thanks to its more powerful engine. The Mirage’s slow steering (3.5 turns lock-to-lock) becomes tiresome at low speeds, such as when parking and navigating tight streets, compared with the City’s more direct 3.0 turns. All that twirling pays off, however, with the Mitsubishi’s 9.6-metre turning circle bettering the Honda by almost one metre. Both suffer from a vague patch around the straight-ahead position and each force drivers to make regular corrections to their line on the highway. The Mirage offers surprising precision once lock is applied in corners, however, and the City a commendable level of predictability. The City’s urban ride is more fidgety than expected from a car wearing 65-aspect Michelin Energy XM1 tyres, feeling fussier around town than the Mirage on its lower-profile 55-aspect Dunlop SP Sport 230s. The City is very smooth and controlled over bigger bumps, however, and though the Mirage’s reactions to variable surfaces are more pronounced, its suspension is quick to correct, keeping it largely composed. Neither car boasts handling credentials beyond competent, though they’re both stable. The Mirage, in particular, feels much more planted than its hatchback sibling thanks to its larger body and 100mm-longer wheelbase. High levels of wind and road noise make the Mitsubishi less enjoyable for occupants. In contrast, the Honda’s sound suppression is above average in the sub-$20K class. The City’s front seats offer more lateral support and its rear bench is angled better, though this tester found the Mirage’s softer pews more comfortable than its flatter, harder rival’s. The Honda eclipses the Mitsubishi across a number of other interior measures, however. The City’s steering wheel features both tilt and reach adjustment, bettering the Mirage’s tilt-only tiller. The City also has 60:40 split-fold rear seats, allowing owners to expand its already-capacious boot, where the Mirage has a fixed backrest. Other slick City niceties, such as its rear-door bottle holders, rear reading light, fabric door lining and centre console bin with lined cover/armrest, push it further ahead of its rival. The Honda’s dashboard presentation is more modern, featuring a colourful instrument cluster and capacitive-touch surfaces, though the Mitsubishi’s utilitarian layout with large buttons is simple and user-friendly. Both lack any form of soft-touch plastics, though the City’s hard surfaces have a higher-quality feel and contribute to a more characterful design. The Mitsubishi Mirage and Honda City sedans both offer a lot of car for a relatively small price. If you’re simply after maximum metal for your money, the base Mirage at $14,490 holds the most appeal, providing space and value and the backing of a long warranty and cheap servicing. If the City’s marginally higher price and servicing costs aren’t an issue, however – and you can’t stretch the budget to the impressive $20,490 Mazda 3 Neo in the next class up – then it’s the pick of this baby sedan duo, offering superior performance, refinement, technology and interior practicality.